Suburban Emergency Medical Services opened their doors on June 5, 1953 under the name “Suburban Fire and Rescue Company.” Suburban’s purpose was to “service the community with emergency First Aid and ambulance services.” The organization was entirely volunteer based providing service 24 hours a day 7 days a week. These volunteers were dedicated community leaders who developed this organization to provide coverage to the municipalities of Palmer Township, Wilson Borough and West Easton. Suburban Fire and Rescue Company’s headquarters was originally located at 27th and Dearborn Street in Palmer Township, and owned two ambulances. This was only a temporary location until Suburban could begin construction of a more permanent facility on Freemansburg Avenue in Palmer Township. In 1957 Suburban began construction on their permanent headquarters at 3231 Freemansburg Avenue, where Suburban EMS still resides to this day. On June 14th 1958, the new Suburban building was officially dedicated and the name “Fire” was stricken from the company’s name. It was then called “Suburban Rescue Company Inc.” The organization at that time focused all their efforts on first aid and rescue. By the end of 1985, Suburban Rescue Company expanded to four ambulances and replaced their 1962 rescue truck with a new 1985 Rescue Truck and state of the art two-way radio. The call volume for the year had grown to 2,516 calls, and ran 23,862 miles to service those calls. 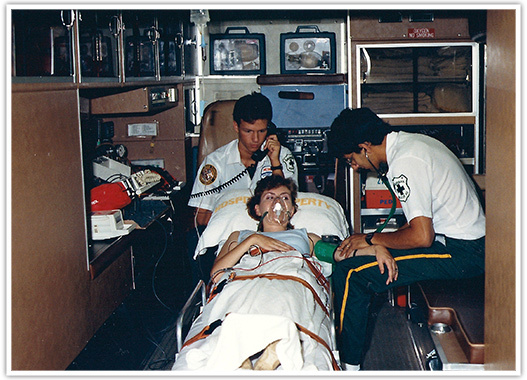 In 1987, due to changing health service requirements and regulations, Suburban saw the beginning of utilizing paid staff with specially trained paramedics. Suburban Rescue Company continued to handle rescue services as well as medical services until 1993. Due to a change in the state law, a fire truck is required to be dispatched in a rescue situation. 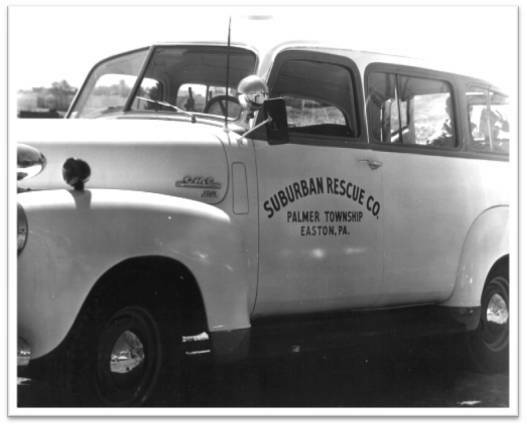 At that time, Suburban’s Rescue Truck was sold to Palmer Township for an additional apparatus to be used by the Palmer Township Fire Department. After the departure of the Rescue Truck the organization focused mainly on their medical services. The non-profit organization Suburban Rescue Company was then incorporated and renamed Suburban Emergency Medical Services. In 2003, Suburban took a giant leap forward and was awarded a contract to provide 9-1-1 services in Monroe County for Stroudsburg, East Stroudsburg, Stroud Township and vicinity. 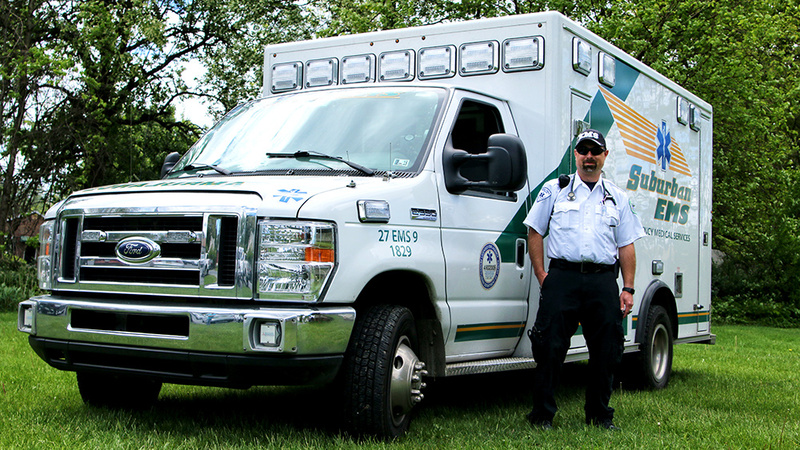 In 2004 employees of Suburban EMS were recruited and trained to create our local strike team. This team consists of five members of our medical staff, whom are specially trained to handle any austere or hostile environment. Currently our strike team consists of all paramedics but EMT’s can join as well. This team of people acts as a mobile emergency medical service that lends a hand where ever help is needed. Our strike team has assisted in evacuation of towns, relocating residents to a safe house or shelter, debris and wreckage clean up and provided medical attention to people in need. Our strike team has been deployed four times to major disaster areas from the past three destructive hurricanes; Katrina, Gustav, and Ike. The strike team is also helpful locally waiting on stand-by during the winter, in case of a major snow storm or ice storm. In 2005, Suburban EMS signed an agreement to take over business management responsibilities for the Medic 9 Paramedic Services which led to a business merger in 2008. This move increased Suburban’s coverage area to include Tatamy, Pen Argyl, Bangor, East Bangor, Roseto, Forks Township (ALS ONLY), Washington Township, Plainfield Township (ALS ONLY), Portland (ALS ONLY) Upper Mount Bethel (ALS ONLY) and Lower Mount Bethel. In the meantime, in 2008, the Forks Township Emergency Squad ran into financial trouble and had to suddenly shut down. Members of the Forks Township Squad and the Forks Fire Department asked Suburban EMS for immediate help. Suburban EMS responded to our neighbor’s need and provided a truck and crews until the squad was back on their feet. On October 16, 2008 Suburban EMS was named as the sole Emergency Medical provider of Forks Township by the Forks Board of Supervisors. Later, in April of 2011, Portland Ambulance Corps closed their doors and Suburban EMS was named the BLS and ALS provider for Portland and Upper Mt. Bethel. Today Suburban EMS has coverage responsibility for emergency services in 19 municipalities. We cover 232 square miles and serve a population exceeding 142,000 people. We have a combined total of 40 vehicles from ambulance to wheelchair vans and a Quick Response/ Command Vehicle at four locations in Northampton and Monroe Counties. We also carry a PUC license, which allows us to be able to transport patients to social functions. We pride ourselves by being a full service medical services and transportation provider. We perform requested stand-by’s for community functions and local community sporting events. We provide CPR and First Aid and Safety training for Police; Fire; Office Personnel; Boy Scouts and other organizations we serve, along with taking an active role in school public safety programs. Suburban EMS has proven to be a quality care service, durable mainstay of the communities we serve for the last 63 years. With quality management, dedication, and hard working employees, Suburban EMS will continue to be one the most reliable, flexible, easy to work with, industry leaders for years to come.